gold coins celebrating the 150th anniversary of the Cariboo Gold Rush; the arrival of the Vikings in Canada, Quebec’s Coat of Arms; the Bluenose and the 5th anniversary of the Mint’s famous "Million Dollar Coin"
"The Royal Canadian Mint’s coins are important reminders of our heritage and we are delighted that our Silver Dollar products honouring the Bicentennial of the War of 1812 lead the way in celebrating Canada’s rich history, culture and values," said Ian E. Bennett, President and CEO of the Royal Canadian Mint. 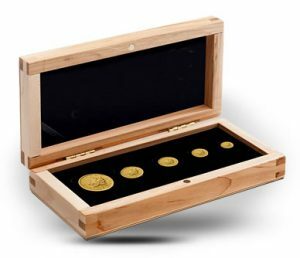 "We are proud to offer customers from Canada and around the world coins which stand out for their compelling stories, their captivating designs and their exceptional quality," added Bennett. The following summarizes the products which will soon be available to the public. The Bicentennial of the War of 1812 remembers a conflict which united English, French-Canadian and First Nations forces in defending the borders and values of a future Canada and introduced two centuries of peace between Canada and the United States. The Mint is proud to commemorate this turning point in Canadian history with its annual Silver Dollar, newly crafted of 99.99% pure silver. 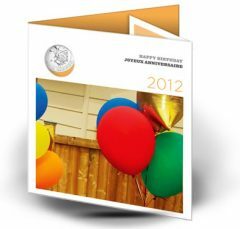 It is available in both Proof (frosted highlights against a mirror-like background) and Brilliant (all shiny) finishes. Designed by accomplished military artist Ardell Bourgeois of British Columbia, this 1812-2012 dated coin features a British Sergeant, a Voltigeur Canadien, and an Iroquois warrior united in the defence of their border against an approaching invader. Behind them is a map showing part of the Great Lakes and Southwestern Ontario, where United States forces sparked the conflict by invading the territory of the future city of Windsor, Ontario on July 12, 1812. Encircling this design are 200 beads finely struck near the rim of the coin to symbolize the 200th Anniversary of the War of 1812. The obverse of this coin features the effigy of Her Majesty Queen Elizabeth II, designed by artist Susanna Blunt in 2003. Limited to a mintage of 40,000 examples, the 2011 Proof Silver Dollar is available for $59.95 CDN and its Brilliant version, with a mintage of 25,000, retails for $54.95 CDN. Visit Mint information page for details. New for 2012, the Mint is offering two types of Proof Sets featuring the Ardell Bourgeois-designed Silver Dollar. The 2012 Silver Dollar Proof Set includes the Proof version of the Silver Dollar packaged with every circulating denomination struck in base metals with a Proof finish, specifically: the one-cent coin in copper; the 5-, 10-, 25-, and 50-cent coins in nickel; the one-dollar coin in brass; and the two-dollar coin with a brass core and nickel outer ring. 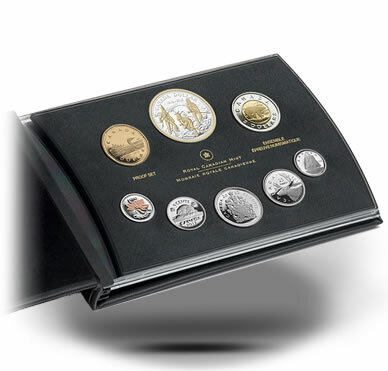 Limited to a mintage of only 40,000 sets world-wide, this coin set retails for $99.95 CDN. For collectors looking for added exclusivity, the Mint has produced a 2012 Fine Silver Proof Set consisting of a special, selectively gold-plated Silver Dollar accompanied with every circulating denomination in 99.99% pure silver. It is the first time in history that the iconic maple leaf version of Canada’s one-cent circulation coin has been struck in silver. The leaves have also been selectively plated in pink gold to emulate the appearance of a newly minted copper-based coin. The one- and two-dollar coins are also plated in gold to recreate the brassy appearance of conventional circulation coins. Only 20,000 of these sets will be made. Packaged in a genuine black leather case, each set retails for $224.95 CDN. The Mint has collaborated with two prominent members of Canada’s contemporary art scene in creating its 2012 gift sets. Buyers of these sets can celebrate a new birth, their love of Canada, the excitement of a wedding or wish a special someone happy birthday in the distinctive styles of Toronto-based artists Gary Taxali and Matt Barnes. Award-winning artist Gary Taxali, known for a retro style combining pop and classical art with 1930s-inspired iconography, has designed the unique 25-cent coins which are the centrepiece of each set. They appear through die-cuts in the cover of each set folder conceived by renowned commercial photographer Matt Barnes, whose work is firmly rooted in the world of pop culture. These popular coin sets, which are perennial favourites among gift-givers, are sure to be remembered for their enthusiastic celebration of contemporary Canadian art. 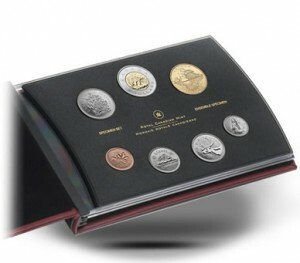 These gift sets contain Canada’s 2012-dated circulating coins, with the 25-cent coin replaced by the uniquely-themed creations of Gary Taxali. Each set retails for $19.95 CDN, while supplies last. 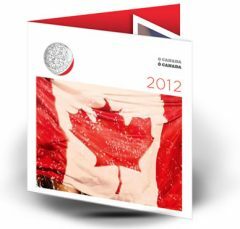 Visit Mint information page for details on BABY, O CANADA, WEDDING and BIRTHDAY 2012 Gift Sets. Matt Barnes and Gary Taxali have joined forces again on the Mint’s second edition of the hugely successful Tooth Fairy Gift Card. Gary Taxali’s whimsical interpretation of the Tooth Fairy is boldly engraved on the reverse of a multi-ply plated steel 25-cent coin. This coin is embedded on the cover of the card which contains another original photographic composition by Matt Barnes. This packaging also includes space to write a personal message; and a detachable envelope to place a coin under a child’s pillow in exchange for his or her tooth. 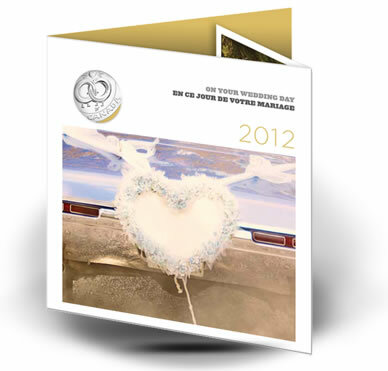 This artful memento is available until quantities last for the retail price of $9.95 CDN. The Mint is proud to introduce two exciting new Year of the Dragon collector coins which are extraordinary in terms of their value, design quality and craftsmanship. A 1/10 oz 99.99% pure gold coin and a ½ oz 99.99% pure silver coin featuring a dragon design by Three Degrees Creative Group Inc. have been garnering numerous accolades for the fine execution of a complex image incorporating very fine lines and details. The Mint’s exceptional craftsmanship is especially evident on the 1/10 oz gold coin which measures only 16 mm in diameter and is smaller than the current 10-cent circulation coin. The shiny finish of the linear design of the dragon against a textured background creates a visually stunning contrast on both the gold and silver coins. 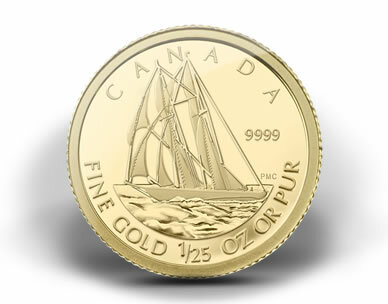 On the market since January 3, 2012 and priced at $229.95 CDN per unit on a mintage of 38,888 coins, the $5 Pure Gold Coin offers the Mint’s smallest premium for a numismatic coin over the current trading price for 1/10 oz of gold bullion. Equally outstanding craftsmanship and value can be found in the $10 Fine Silver Coin which is available for $29.95 CDN on a mintage of 588,888 coins world-wide. The silver coin can also be purchased in a 20-pack retailing for $599.00 CDN, which is a great way to spread wishes of good fortune to family and friends in the New Year. Visit Mint information page for details on the Year of the Dragon $5 Gold Coin and $10 Silver Coin. The Mint continues to celebrate the captivating symbols of heraldry on its bi-annual 14-karat gold Provincial Coat of Arms, which continues with the Province of Quebec. First granted by Queen Victoria in 1868, Quebec’s Coat of Arms was revised in 1939 by the provincial government to more accurately reflect the province’s history and heraldic symbols. A shield composed of three horizontal fields represents its founding influences: three fleur-de-lys at the top for its French roots; the lion in the middle for Great Britain; and the three maple leaves at the bottom represent Canada. Beneath the shield is the motto "Je me souviens," which calls on all Quebecers to honour and preserve their history. 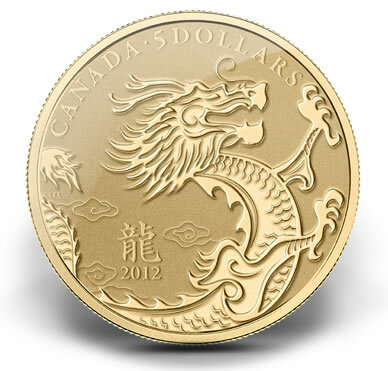 Limited to a world-wide mintage of 500 coins, this impressive 50 mm gold coin retails for $2,649.95 CDN. New for 2012, the Mint’s annual $200 gold coin is crafted from 99.99% pure gold as the theme of a Great Explorers of Canada series opens with the Vikings, Canada’s first European explorers and settlers. While the exploits of legendary Norseman Leif Erickson are well documented, credit for the first European sighting of Canadian land goes to a seafaring merchant named Bjarni, who ventured off course between Iceland and Greenland. His story of a great forested shore inspired Leif Erickson to set out on his successful quest for Vinland 15 years later, which brought him to the coast of modern-day Newfoundland. 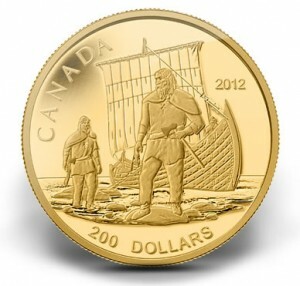 The legacy of the Vikings in Canada, preserved at the UNESCO World Heritage Site of L’Anse aux Meadows at the northwest tip of Newfoundland, is now immortalized on a 29 mm diameter pure gold coin featuring a pair of Vikings standing on the shores of a new world, with their trusty knarrmerchant ship anchored in the background. 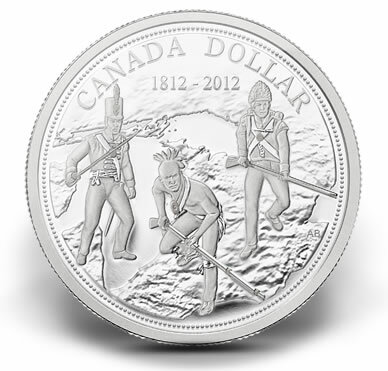 This intricately engraved design comes from accomplished naval artist Yves Bérubé, who was also responsible for the 2010 Silver Dollar celebrating the centennial of the Canadian Navy. 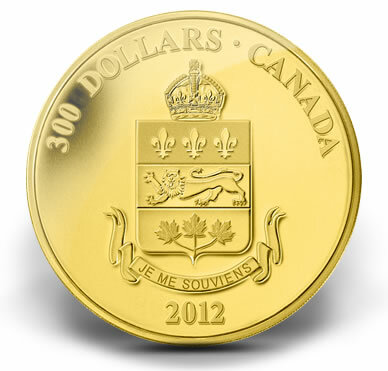 Limited to a mintage of 3,000 pieces world-wide, this coin retails for $1,199.95 CDN. The Mint’s annual 14-karat gold coin bearing a $100 face value commemorates the rush to British Columbia’s Cariboo Gold Fields in 1862. Tales of "rivers of gold" by four men returning from the creeks of the Cariboo region triggered a gold rush from as far south as California in 1861. This wild and inaccessible territory required the building of a hugely expensive and dangerous wagon road through massive mountains, as well as across deadly canyons and glacial rivers. This challenge inspired a fascinating and little-known side-story of that celebrated event. Hearing that camels had been successfully used for long distance transport in Texas, Arizona and California, an enterprising merchant named Frank Laumeister thought these animals would solve the big logistical challenge of reaching the Cariboo Gold Fields. Unfortunately, these animals were not built for the treacherous mountain terrain of the Fraser Valley and the experiment of "Laumeister’s Camels" was brought to a swift end. This curious window on Canadian mining history is illustrated on a gold coin designed by artist Tony Bianco, creator of many previous coin designs. With only 2,500 examples available world-wide, this coin retails for $599.95 CDN. Today, the Royal Canadian Mint is admired for its ability to refine the purest gold in the world thanks in large part to the bold launch in 2007 of a 100-kilogram 99.999% pure Gold Maple Leaf bullion coin with a $1 million face value. This record-breaking coin set a new standard for gold bullion coin purity which remains unmatched today and also earned a Guinness World RecordsTM certificate as the world’s largest gold coin. Only five of these giant Gold Maple Leaf bullion coins have ever been produced, four of which were purchased by individual collectors, while the last one remains at the Royal Canadian Mint. While its diminutive weight remains unchanged, the Mint’s 1/25 oz 99.99% pure gold coin continues to gain in popularity for the intricacy of its miniature detail, trademark quality and affordable price. Thanks to the collaboration of the Bluenose II Society, it makes its 2012 return with a depiction of the celebrated Canadian schooner Bluenose by late Nova Scotia artist Philip MacReady. Winner of many International Fisherman’s Trophy series of yachting races since its launch in 1921, the original Bluenose was lost off Haiti in 1946 after a distinguished racing and commercial career. This historic ship was revived when the Bluenose II was launched in 1963. 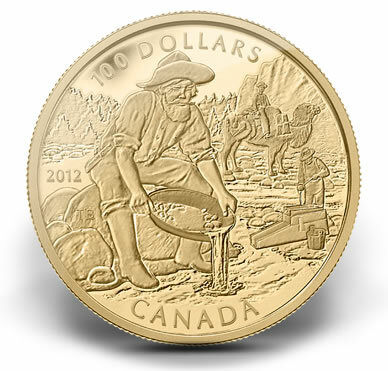 It has graced Canada’s 10-cent circulation coin since 1937 and the Mint is proud to grant it a new place of honour in 2012 on a new Proof gold coin. Limited to a world-wide mintage of 15,000 coins, this miniature work of art retails for $129.95 CDN. Many avian species have graced the reverse of the limited-edition aureate one-dollar coin featured in the Mint’s annual Specimen Set but the time has come for the Common Loon to rejoin the flock as the Mint marks the 25th anniversary of the introduction of the one-dollar circulation coin simply known as "The Loonie." Like its namesake, the Loonie has proven resilient, emblematic and long-lived. This iconic bird, accompanied by two young chicks, has been re-interpreted by Ontario artist Arnold Nogy, whose bird coin designs appear on many popular collector coins. This new one-dollar coin, struck in a Specimen finish, is accompanied by specimen versions of all of Canada’s traditional 2012 circulation coins (with the exception of the Common Loon $1 coin). The limited world-wide mintage for this popular set is 35,000 and it is available for $49.95 CDN. Another mainstay of Canadian coin collections is the Mint’s annual Uncirculated Set. Due to popular demand, the Mint has produced 75,000 of these sets for 2012, which feature all of Canada’s circulating coins, which showcase Canada’s diverse iconography. 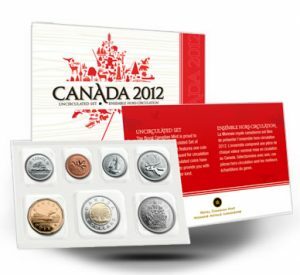 The 2012 Uncirculated Set sells for $23.95 CDN. All of the Mint’s products are available directly from the Mint at 1-800-267-1871 in Canada, 1-800-268-6468 in the US, or on the Internet at www.mint.ca. The coins are also available at the Royal Canadian Mint’s boutiques in Ottawa, Winnipeg and Vancouver, as well as through our global network of dealers and distributors, including participating Canada Post outlets.